Lowdown: A young boy goes on a fantastic quest to regain a divided planet ruled by evil creatures. I might be going on a limb here, but I do feel as if prior to the age of computer special effects Hollywood has failed to give children enough in the fantasy department. One can find plenty of fantasy books dealing with all sorts of fantastic universes, but in the movie world things tend to be much more grounded in familiar territories. Of this particular genre, 1984's The NeverEnding Story was probably my childhood favourite although I cannot say it preserved its status during more recent viewings. That said, 1982's The Dark Crystal seems to have left its mark on many, too; and while it was never a favourite of mine, it does have the might of Jim Henson (of Muppets glory) on its side. This puppet starring movie takes place at a fantastic world divided between its rulers, the evil vulture like Skeksis, and the peaceful goodies Mystics. The Skeksis have been ruling for a while now, using power gained by the dark crystal that gives the movie its name; however, their reich is destined to be doomed in a prophecy claiming that a humanoid child would topple them over by fixing the now broken crystal and turning it pure again. Cue in the humanoid orphan boy Jen, who will fight monsters and encounter all sorts of creatures on his fatalistic path to make that prophecy real. It's funny what modern technology can do. The Dark Crystal I remember always had fading colors and poor quality picture overall; this time around I got to watch it in all its sharp and colorful might. On the other hand, modern technology has pretty much rendered this one obsolete in anything other than the nostalgic department; it cannot compete with the full might of CGI. Even through nostalgic lenses, I cannot claim I particularly enjoyed this predictable movie. Sure, there is some fun to be had with some of the characters, but the whole thing feels lacking in depth; baddies are baddies because they look ugly, and characters are developed to the level of cute or nasty. Clearly, the production lacked the money to render the story to its full potential. 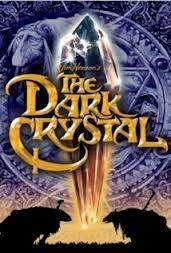 Still, one does have to give The Dark Crystal credit: not only is it an amazing achievement in puppetry, it is also one of the few children tales of fantasy to grace our screen during the decades prior to the forceful entry of the digital world. Overall: An interesting museum piece of 2.5 out of 5 crabs quality.